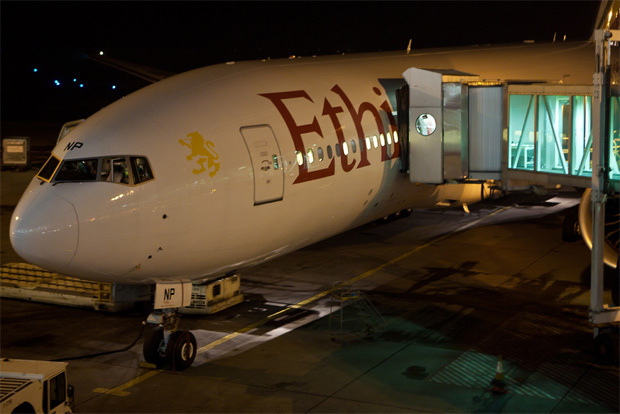 WASHINGTON, DC — Four flights, 44 hours of flying and one day trip to Ethiopian Airlines headquarters in Addis Ababa later, we’ve gathered quite a story about one of Africa’s fastest-growing carriers. Over the next month, NYCA will be debuting a three part series focusing on the Ethiopian carrier; their in-flight service, their history and their future. We hope you’ll join us for the adventure! The first in the three part series, we review the in-flight experience in the economy cabin on board Jo’Burg to Addis and Addis Ababa to Dulles flights. 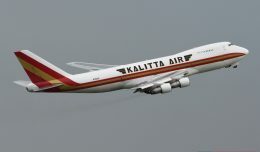 Both flights were inaugurated during the mid- to late-1990s as part of an aggressive expansion of their international service surrounding their 50 year anniversary (1996 and 1998, respectively). 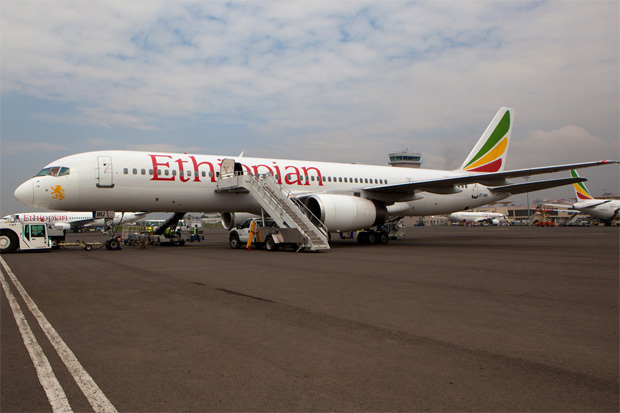 While Ethiopian provided the flights to NYCA at no charge, you’ll see that in addition to praising their strengths, we honestly point out some shortcomings too. The flights were surveyed in September 2011. Starting in the domestic terminal, locating the international check-in desk was a bit of chore. After some effort, we found it and waited in line for about thirty minutes. Once ticketed, customs and security were both very straightforward and easy. The inbound flight from Addis was running late, and we spotted an Ethiopian Boeing 757, not the listed Boeing 767, rolling to a stop on the runway about twenty minutes prior to boarding time. Nevertheless, boarding began only eight minutes late at 1348 local time, and we settled into 15A for the five hour flight north to Addis Ababa. Our carry-on has no problem finding a home, and the camera comes out for departure. 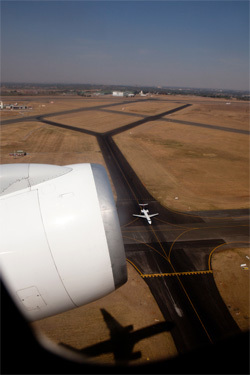 The 757 being the performer that it is, we rocket nicely out of Johannesburg about 32 minutes behind schedule. Considering the 757’s are some of the older aircraft in a fleet that is otherwise quite young, the quality of the cabin is remarkably good. All the economy seats are (p)leather clad and comfortable enough for economy. They feature a workable 32 degrees of pitch and feature a built in remote in the armrest for selections of music or movies. This particular aircraft was not outfitted with personal TV’s but did have the screens that are fixed to the cabin ceiling. The programming began about 45 minutes in with the smaller shows through dinner culminating to the movie about three hours in. 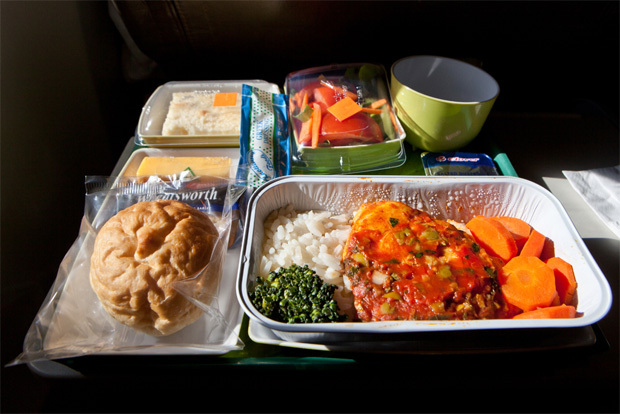 A meal & drink service began about an hour into the flight presenting options of chicken or fish. The meal consisted of chicken breast with a tomato sauce, rice and carrots. A roll with butter, crackers & block of cheddar cheese, salad with Greek dressing, and packaged desert of coconut cheesecake with berry sauce complimented the main dish. Overall it was a serious step up from anything you’d get domestically in the US nowadays, but it was not ultra fantastic either. It was satisfying, filling, warm & good. The meal was followed up by traditional post meal coffee and tea service. Trays were cleared about an hour following dinner, which appeared problematic for many of the other passengers, most of whom were done within twenty minutes. 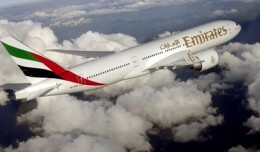 While not watching the movie most of the flight was spent sleeping or talking up the staff in the rear galley. Speaking of the staff, there were some noteworthy exchanges. For the first, we attempted to inform a flight attendant that one of the lavatories had an issue needing attention – we never received a response. On the flip side, we had questions about customs in Addis that we posed to flight attendants in the rear galley. All three were very helpful in answering each and every question in addition to pouring us a few drinks. The one issue aside, the crew met or exceeded expectations for friendliness and professionalism. We wish we had more pictures from this flight, but unfortunately the vibe was not right for it, so the camera stayed put away through most of it. Despite the late departure we made up the time in the air and ended up landing ten minutes early; a nice surprise. After waiting for Cloud Nine business class passengers to vacate, we de-boarded via the air stairs and onto large busses that took us the short distance to the terminal. Arriving at the ticket counter around seven at night after a long day, it was relieving to see a ticket counter dedicated solely to the flight. Check-in was smooth and fast, with customs and security following suit. 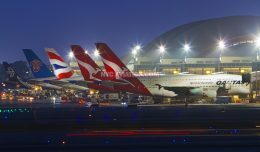 At 2130 the flight began to board, and twenty minutes later we settle into 23A for seventeen hours aboard the brand-spanking new Boeing 777-200LR (ET-ANO). Wheels were up about twenty minutes late, and we were off to Rome. Twenty minutes is not the end of the world though, and we predictably made it up en route while trekking over Sudan, Egypt, and the Mediterranean. Much like the prior flight from Addis to Jo’berg, the first meal service promptly began about an hour in. We were offered choices of chicken, beef, or fish. We chose chicken. It was bathed in a cream sauce along with rice and carrots. A side salad, crackers & cheese, and a roll with butter were also provided. The meal was of average quality and filling. It might have been better – or we might have been a better judge – had we not had a nasty head cold that developed from the day before. As a result, our sense of taste was not in its best form. While waiting for the dinner tray to be cleared we spent some time playing games on the seat back entertainment system. Shortly after, while starting a movie, the entertainment system froze and then shut down completely. My seatmate had the same problem, and flagged down a flight attendant who attempted to rectify the problem. About thirty minutes later the system restarted and continued operating without issue. Most of the rest of the first leg is spent asleep. We touched down in Rome almost twenty-five minutes ahead of schedule at 0300. A short taxi later we’re in position on a remote ramp for a refuel. Most of the cabin is asleep, watching a movie or reading a book, and no one seems to notice that the hour scheduled stop has come and gone. About ninety minutes in the pilot announces that we’re still taking on fuel and it’ll be another hour: plus some tires have “low pressure” and need to be replaced. Frankly this sounds fishy to us, low pressure in the tires does not normally require replacement unless they were totally flat, but maintenance is what it is: worrying does not pass the time any faster. The correct tire jack does not arrive for another two and a half hours. By the time the plane has been refueled (twice by the pilot’s record) and fixed up with new tires the stop in Rome lasts just over five hours: No fun. That being said, the airline and the flight crew did a great job of making an unfortunate situation tolerable. Consider: the plane was kept cool, powered, and the entertainment functional the entire five hours. The crew completed a meal service (we’re told it was breakfast, feeling pretty awful we slept through it), and offered drinks the whole time. And they kept smiling to boot – impressive. We finally set off for Rome four hours behind schedule, with wheels up at 0801 local time. Cutting to the product itself, the seat-back entertainment is quite nice. The on-demand offerings ranged from TV to games, flight maps to movies. 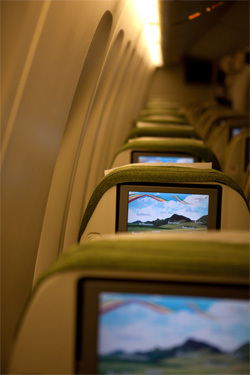 The screen can be operated by touch or by a remote built into the armrest. Like the prior flight there is 32” of seat pitch. The seat reclines a standard amount, with the bottom pushing outward to reduce the amount of headrest in the space of the passenger behind you. 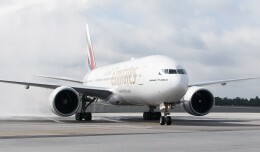 The airplane being new (the average age of the 777 fleet is under one year), the cabin is predictably in great shape and the newness of the airplane impresses a lot of travelers. The 3-3-3 setup feels reasonably spacious, despite the cabin being full to the brim (287 folks on board). The remaining nine and some change hours en route from Rome were largely spent sleeping and catching a few movies. Still feeling rather ill, we declined brunch except for a ginger ale, though the food of my seatmate appeared to be similar in nature to the late night dinner we had some twelve hours earlier. We greased the runway at Dulles at 1117 local time and pulled up to the gate quickly. Deboarding was a bit chaotic, but with a little planning we ended up being first off those annoying Dulles customs shuttles, allowing for a quick sprint through customs and back into the good ole U S of A. Regarding Flight 808 to Addis, it was a slightly above average economy experience. The service and staff were generally friendly and fast, the food was good, and the seat on par for an economy experience. Personal entertainment systems, like a seat back system, would have been a bonus, but the five hour flight is not terribly long: bring a book or an e-reader if you need some help passing time or utilize the in-flight entertainment. When compared against most US domestic economy sections, this flight comes out looking good. With the variance on plane types for the flight, you might even be treated to an oversized Boeing 767. Moving on to Flight 500, let’s cut right to it: seventeen hours on an aluminum tube in coach is never going to be a picnic no matter the carrier. And even worse when an unexpected delay pushes it to twenty-one straight hours. Addressing the delay, a five hour ground stop for fueling and tire replacement seemed excessive, but this is also a moment that forces an airline and a crew to show their true colors. In this respect Ethiopian met or exceeded expectations: they kept the plane powered and cool and the PTV’s running, they completed a food service, and they kept drinks available through the entire stopover; with a smile. What could have been a nightmare worth writing home over instead turned into an opportunity to show off the airline and crews ability to manage a stressful situation and make the best out of it. 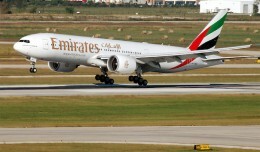 The vast majority of the time, however, the flight will not experience a similar delay and by and large customers will find an enjoyable economy experience. Friendly service, plentiful and decent hot meals, and a well stocked entertainment system help the scheduled seventeen hour flight go by fast. Overall, while other reviews online are not especially positive, this traveler had a markedly pleasant experience on both economy flights even with the five hour delay in Rome factored in. This author feels that most travelers will find themselves pleasantly surprised and that coach travelers can rest assured that they will be kept comfortable and well fed on board Ethiopian economy. When you consider too the prices that the carrier has recently offered on the flights, it is an option that is hard to pass up. In conclusion; if you are looking to travel to Africa in the future and need a quality economy experience at a good price, do not overlook Ethiopian Airlines.